A Power Assisted Bicycle, is essentially a traditional bicycle fitted with a motor. We have all seen Grandpa's backyard lawn mower engine jobby racketing down the footpath with a trailing cloud of petrol fumes, however that is a very different beast to real deal e-bikes. An e-bike motor is activated by pedalling and can provide up to 250 watts of power. The motor is powered by a rechargeable battery fitted on the bike. In the Northern Territory, e-bike motor power output is restricted to 25km/hr. Basically yes you can have a bike, which has motored assist fitted but there is a max power output and speed limit. Any e-bike purchased from your local bike shop should fall under these guidelines. For more information regarding the legal use of e-bikes in the NT, read this Info Bulletin from the Department of Transport. e-bikes are just for lazy people aren't they? Now some people are going to crack a fuss and say why the hell do you need that? Pedal harder you lazy bastards! What about old mate who has leg muscle degeneration? Or the loving partner who wants to humour their cyclist partner and go on rides with them but doesn’t have a hope in hell of keeping up? The tourist who wants to see the sights of a new city quickly? Or the commuter who wants to roll into work sweat free? There are plenty of valid reasons for riding Pedal Assisted Bikes and also because they are just so darn fun. Are e-bikes really that popular? Pedal Assist Bikes make up only a small proportion of the the bike sales market in Australia at the moment but is it increasing at a phenomenal rate and is one of the largest growing sectors in the Australia. For anyone who has travelled through Europe, they can attest to their popularity. For example, a quarter of all bikes sold in the Netherlands are e-bikes! You may as well be asking "how long is a piece of string?". They may have started out as recreational bikes, but you can now ride an electric version of pretty much every style of bike. From road bikes to full carbon fibre dual suspension e-mountain bikes and everything in between. Therefor, the price of an e-bike varies accordingly. You can pick up a commuter/recreational style e-bike for ~$1,799 and spend upwards of $10,000 on a full carbon dual suspension e-mountain bike. 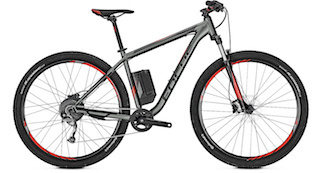 How many kilometre range do e-bike batteries have? Most e-bikes are available in a range of battery sizes which will determine how many kms you can ride with the added power boost. Off the shelf e-bike battery battery life can vary from 60km to 250km. How many of us have run out of petrol whilst driving and had to pull over and call mum or dad or someone to come help? Well the upside to riding a Pedal Assist Bike is that if the battery goes flat, you can still ride it like a regular push bike. Just a keep on pedalling and when you (finally!) arrive home, just plug your battery into the mains to recharge. Battery charging times vary according to the battery's size. Anywhere from 3 hours to 8 hours to reach 100% charge. An electric bike give you a little something extra, a little power boost. They can help you get you to all the places you want to explore, to work, for exercise, with a smile on your dial and without breaking a sweat.